We were distracted by the flurry of iPad-related stuff coming into the office and neglected our iPhone (and now iPad) programming studies. However, the Memorial Day weekend gave us some focused time to work on the last bit of Chapter 3 and to begin Chapter 4 (multiple view apps). The various teaching techniques of this book is starting to have their effects. Tons of graphics keep our brains engaged. The conversational style helps us pay attention to the “dialog.” The various challenges, exercises, questions, and activities are surprisingly effective in helping us learn and retain the material. 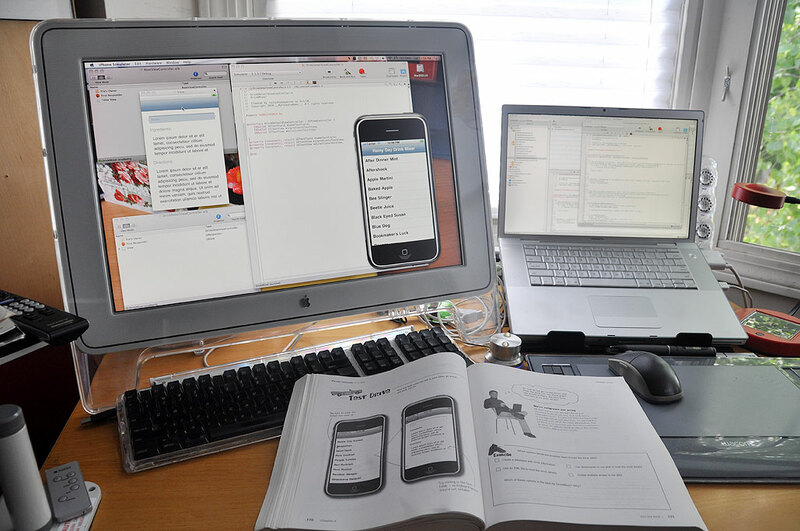 Until now, the programming exercises were mostly an introduction to the iPhone development environment. None of them could be used as a framework for building anything for the iPhone. Chapter 4 is different. 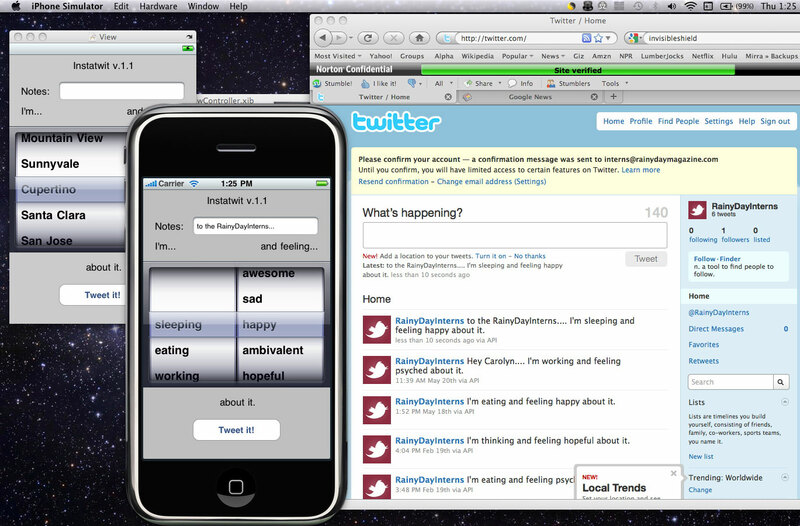 It uses a pattern which was used to develop some of the actual apps which shipped with the iPhone (mail, notes, address book). Chapter 4 introduces apps using multiple views. 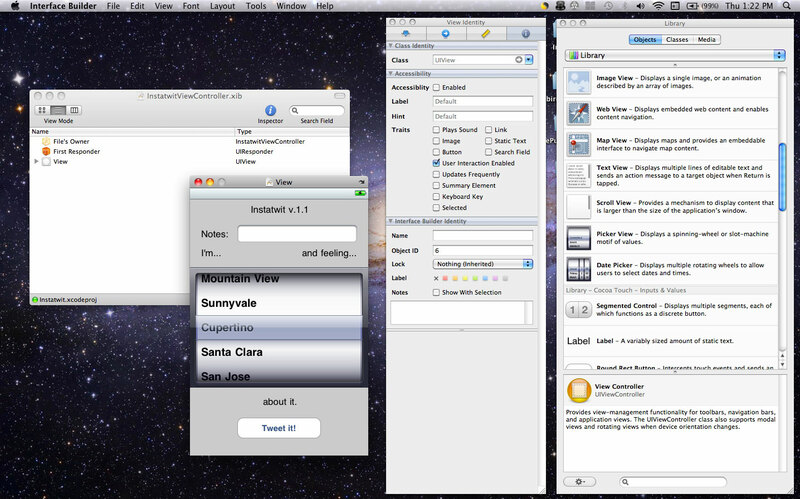 It will walk us through the steps of thinking about the flow, layout of different views, and creating the UI. What it also means is that our 15″ MacBookPro screen may get crowded in a hurry. If there was one thing we learned from our years of programming, it is that there is never enough virtual screen space when you are developing an application. However, since adding a second monitor to a Mac is basically plug-and-play (with the exception of a Mac mini), you can easily increase your screen space. We rearranged the desk and made enough room for a 20″ cinema display. Having this second display enabled us to keep many more files in view, which created more efficiently switching between Interface Builder, Xcode, and the iPhone Simulator. Having a larger second monitor made a huge difference in our progress. It was easier to lay things out, to edit code, and to read documentation. If you find yourself constantly moving windows around or hiding/unhiding them, then maybe it is time to rearrange your physical desktop, get a bigger monitor, or add a second display screen. When you are spending a lot of time in front of the screen, every little improvement pays huge dividends down the road. Invest in one. You will be glad you did.